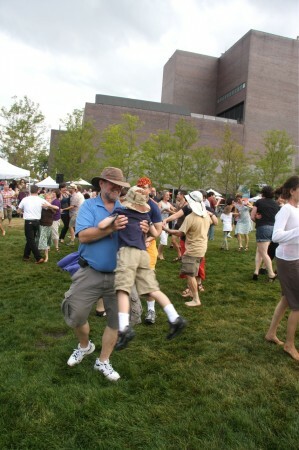 “Hand over hand and heel over heel” FFS September was a memorable day at the Walker that created unexpected ties across Minneapolis communities. Local artist Amanda Lovelee graced the Open Field with the notion that art-making, traditional dance and a photo booth with specific guidelines could encourage unlikely meetings and conversations among strangers. In the absence of the Ice Cream Socials of a bygone era it is less common these days to socialize, much less dance, with a complete stranger. 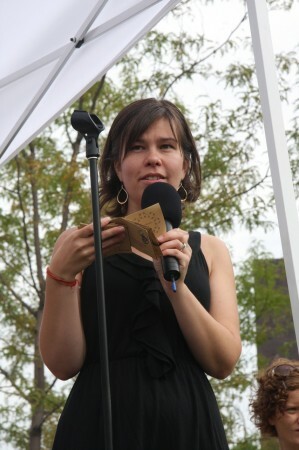 Lovelee inspired the Free First Saturday crowd as well as any passers-by to expand their social sphere by taking the hand of a stranger, introducing themselves and start square dancing. 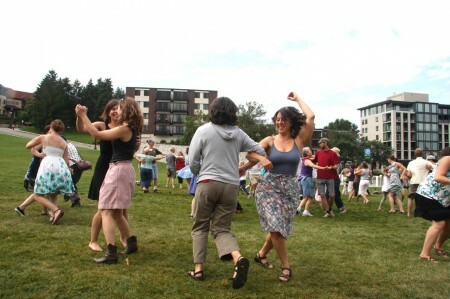 Skirts spinning and faces grinning, the dancers moved together, following the instructions of the seasoned square dance caller, Ann Carter, as an upbeat live band played the classics. The photo booth was a conversation starter as well, the operators asking participants to find someone they didn’t know and have their portrait taken as a pair. The public joined in to create a multi-generational album and perhaps made a few friends along the way. In the same collective spirit the art-making tent was busy with families building a giant collaborative accordion book filled with ‘Objects of Utopic Structure’. Depicted were family vacations, sea monsters, bald spots and anything else that induced a little happiness. Staring down the hill at the throng of beginner square dancers skipping and shouting in unison it seemed like Ms. Lovelee was on to something, something important, a little old-fashioned and quite magical.